Recently I saw a post over at Bookavid about why you should really be doing more tags on your blog! Her post (and the fact that I love book tags) inspired me to find more tags to take part in. I found this tag on Spines and Covers, but it was originally created by Booktubers Chami and Ely. Was I tagged? Err, nope! But I'm playing along anyway! Now, on to the questions. Well, this year is easier than last since, well, I just haven't read as much as I normally do. :/ Although there have been some good reads, Now I Rise is the best so far, hands down! I wouldn't be surprised if it makes my top five of 2017 in my year-end survey! Now I Rise was an incredible sequel that didn't suffer at all from second book syndrome and I can't wait to get my hands on book three! Oh, um, this is awkward. Can I pick the same thing for two questions in a row? If I'm trying not to be lazy and pick Now I Rise for every category, I'd have to go with Waking Gods, the sequel to Sleeping Giants! It's a super unique sci-fi that I highly recommend even if you think you don't enjoy science fiction. Oh man, this one is hard. I'm so behind! I think I have to go with Flame in the Mist, though. I've heard so many fantastic things, but I haven't had a chance to read it yet! Luckily, I just got a copy in the mail and should be making time soon! There are so many!! I think my absolute most anticipated (and don't hate me for this!) would have to be Origin by Dan Brown. Yes, there are a TON of YA releases I'm dying to get my hands on, but you have to understand. There hasn't been a new Dan Brown book in FOUR YEARS! And they have been tortorous. You better believe I preordered Origin as soon as I could! Oh look, another reason for you to hate me! My biggest disappointment of this year was A Court of Wings and Ruin, no contest. It was my most-anticipated sequel in the 2016 End of Year Survey! ACOTAR and ACOMAF are the two books I have read more than any other books, ever. But ACOWAR was a massive let-down. You can check out my review if you're interested in exactly why! That would definitely have to be Roshani Chokshi! I wasn't sure I would like The Star-Touched Queen when I finally picked it up, but it completely blew me away! The writing was gorgeous and perfect and for some reason I haven't picked up A Crown of Wishes yet, but I definitely will as soon as I can! Well, here I go using the same thing for two answers, but I'm doing it anyway. I'm going back to The Star-Touched Queen because my favorite new crust of the year is obviously Amar! How could anyone read that book and NOT love him? While I don't have any real crushes in this world, I love all the characters in the Falling Kingdoms series! There aren't any that I found to be extremely dumb, which is always a bonus. My favorite is probably Magnus so far, though! The Gentleman's Guide to Vice and Virtue gave me ALL THE FEELS! I was smiley through so much of that book! I haven't reviewed it yet, but you need to read it! This year I finally got my hands on a copy of The Gathering Dark, the original UK edition of Shadow and Bone by Leigh Bardugo! I tried trading for it forever and finally decided to just buy a used copy I came across. It is just as gorgeous as I thought it would be! Too many to list! A few I'm hoping to get to that I haven't already mentioned are That Inevitable Victorian Thing, The Hummingbird Heart, Warcross, and The Glass Spare! Thanks for sticking with me till the end! 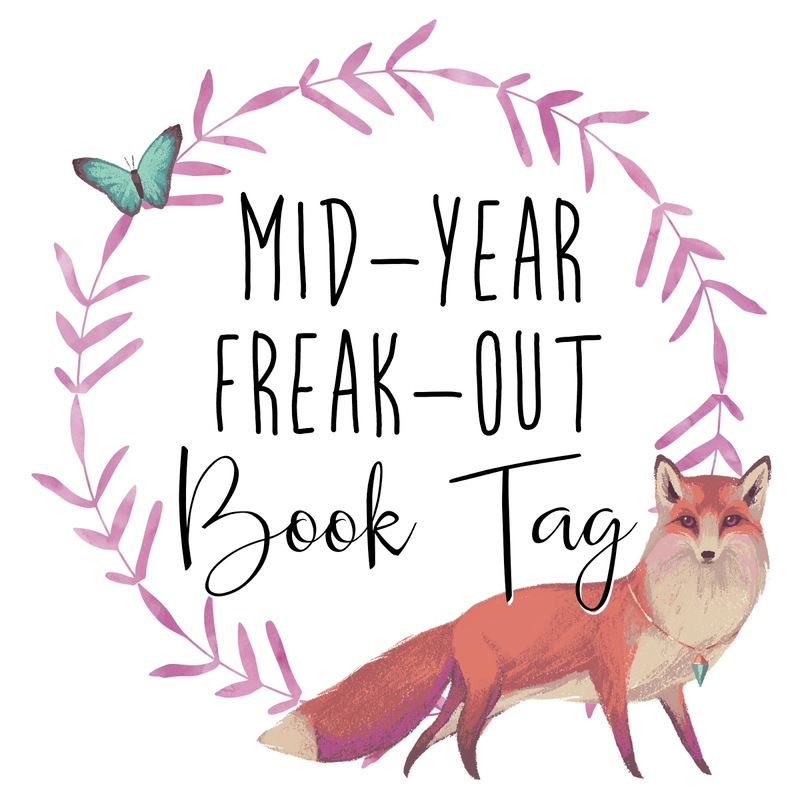 If you're still here, I tag you to do the Mid-Year Freak-Out Tag!